Frequently here at WCS Archives, I find myself reflecting on public experiences and encounters with the natural world, and the challenges of conveying rural and field perspectives and experiences in an urban context. It is particularly true on Wednesdays, when admission to the zoo is free, and streams of families, teams of teens, as well as school groups with tethered young potential zoologists, naturalists, and conservationists come to visit, many for the first time. A typical opportune sighting presently available to park visitors at the Zoo. 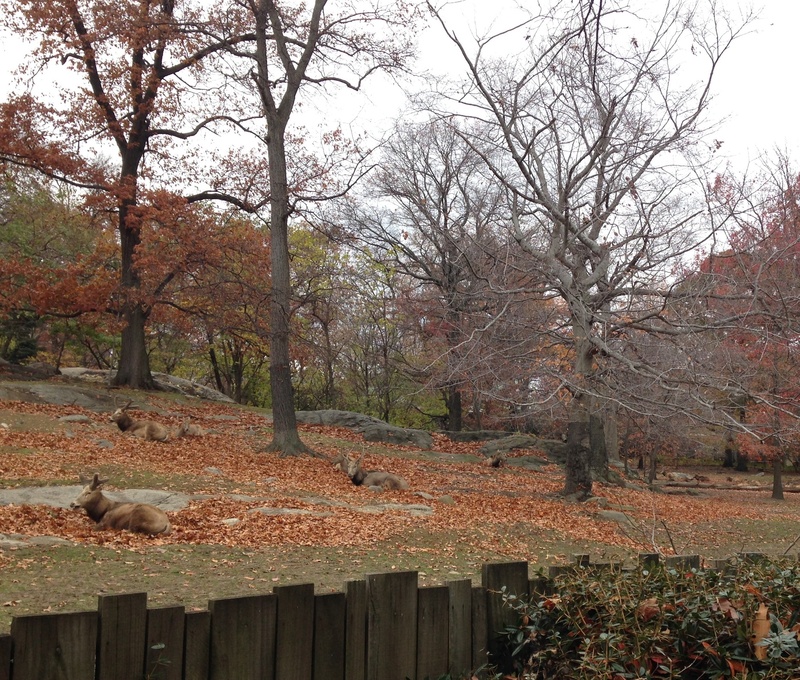 A pasture dotted with a group of Père David deer amongst the surrounding fall foliage of the season. The Rare Animals Range, a former exhibit which opened in 1973, featured this Asian deer species as well as Mongolian wild horses (Przewalski’s horses) and European Bison (wisent). The press release produced for the exhibit opening stated, “all three species are extinct in nature and exist today only in zoos and preserves.” Photograph by Emma Curtis. 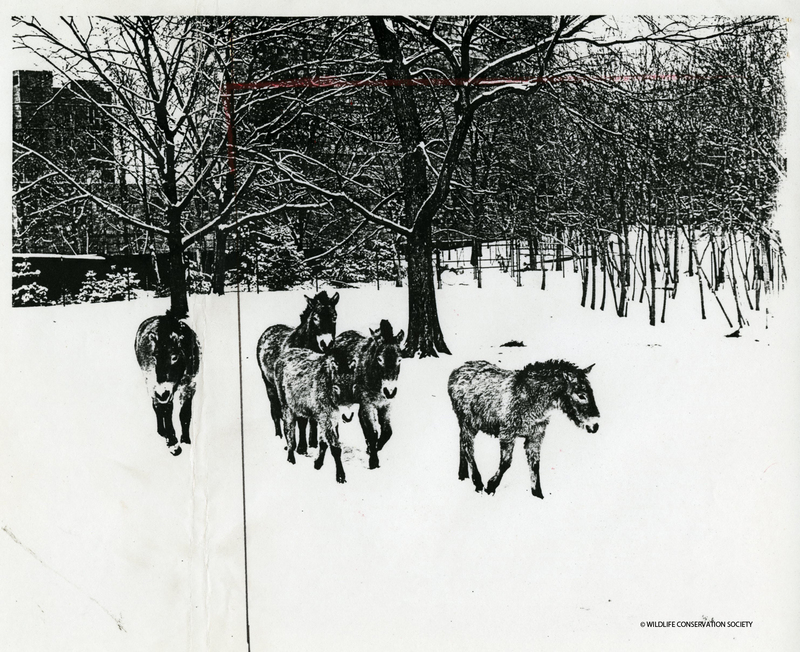 Recently a file relating to the promotion of the New York Zoological Society’s [NYZS] herd of Mongolian wild horses in the late 1970s passed by my desk here in the WCS Archives, as work continues on the processing of NYZS Public Affairs collections. The contents serve as a small behind-the-scenes window to NYZS and as an example that raises questions regarding how the Society cultivated the experience of wildlife and the natural world for the benefit of its visitors over the course of its history. In particular, what roles have NYZS’s education, publications, public relations, advertising, special events, marketing, and communications staff over the years played in this process? Correspondence, typed memoranda, and handwritten notes frequently appear in the press release files. 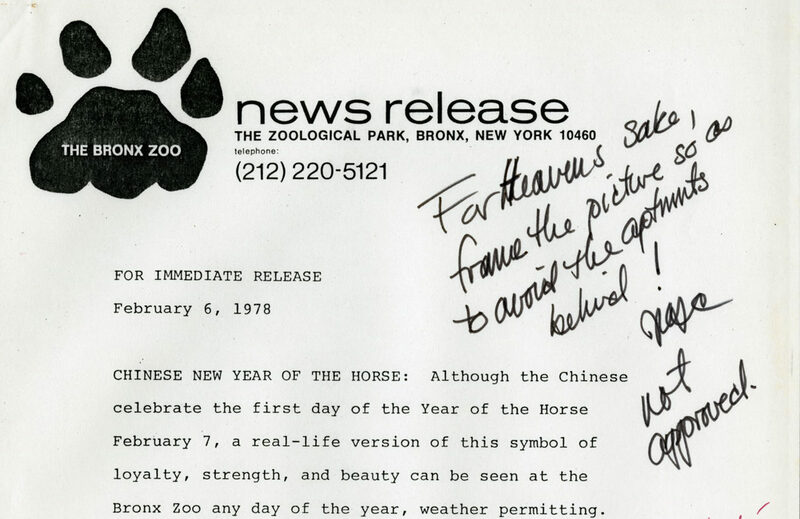 This draft of the “Chinese New Year of the Horse” press release accompanies the edited photograph featured below. The annotations here are from General Director William Conway. Press release February 6, 1978. Scanned from WCS Archives Collection 2032. This file is one of my favorite examples of late among these records. Particularly because through it, one can begin to see and get a sense of the multiple layers of NYZS staff that were involved in crafting a vision together to deliver to the public. The textual narratives found in mid-to-late 20th century press releases, particularly those from the 1940s and 1950s, often include comical and creative storytelling that invite a sense of curiosity about the zoo, its inhabitants, and the multiple worlds the zoo contained. Later releases, such as those from the 1970s, contain practical information for the visitor and highlight important factual information about the Society’s progressive efforts in the fight for the preservation of numerous animal species to save them from their plight across the globe. Society photographers responsible for representing NYZS on film have been known for going to great lengths to capture the Zoo and Society facilities at their best angles. And what of the watchful editorial eyes? Their perspectives also helped perfect the message that would hopefully play a key role in fostering public curiosity, empathy, love, and respect for the natural world, as well as a sense of connection between humans, animals, and their habitats for the benefit of the livelihoods of all. A reproduction of a photograph taken by NYZS photographer William Meng (1969 – 1996) that accompanies the press release for the “Chinese New Year of the Horse.” Crop marks in red and black appear on the picture plane on the left and top edge of the image featuring NYZS’s Mongolian wild horses. 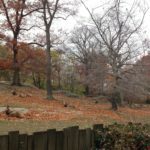 These edits highlight elements that concerned General Director Conway, namely the context of the zoo’s urban environment, when creating an image representative of the Zoo’s facilities and animal collections intended for public consumption. Photograph by Bill Meng, circa February 1978. Scanned from WCS Archives Collection 2032.